Flamenco en Café del Duende »« Valencia: Spain’s Best Climate? 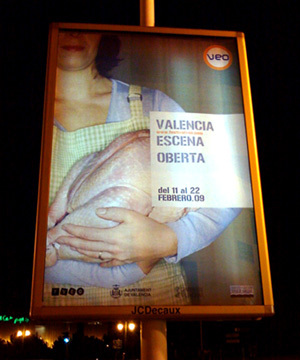 You might have seen the posters blanketing the city, advertising the Valencia Escena Oberta (Valencia Open Stage) — you know, the one with the lady cradling the turkey. It’s an image that I find oddly comforting. Ahh… I just got it. VEO is also the word for ‘I see’. Clever. The VEO is an annual festival, now in its 7th year, inviting various performing troupes from around Europe to converge upon the plazas and spaces of Valencia. From the 11th to 22nd of February, you’ll be able to catch an eclectic range of performances, a number of which are free. Whether your preference is dance, acrobatics (we saw an excellent acrobatic troupe out of Berlin, during last year’s festival), music, drama, or just weird interpretive art, you’ll find something of interest. The program is too packed to describe in detail, so below we’ve linked to the various locations on the festival’s official website, http://www.fundacionveo.com/. Anything special you’re looking forward to? I’m not sure what we’ll go see, but we’ll be sure to post about any event we attend! awesome gracias. Just got tickets to the circus in viveros and got the 40% discount since it is still the 10th, well the CAM website thinks it is.